The South African Rugby Players Association (SARPA) have expressed their concern at reports hinting at a possible split within SANZAR. The South African Rugby Union (SARU) admitted this week that the relationship with counterparts from Australia and New Zealand, the other two countries which make up the body that governs the sport in the three nations, had been strained in recent months. 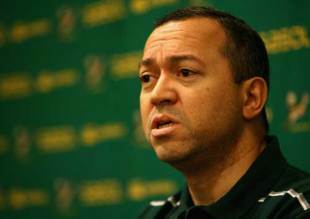 In an interview with the Sunday Times newspaper Dr Jan Marais, the chairman of SARU, revealed that a decision had been made at the union's executive council meeting last week to look at alternatives to the Tri Nations and Super Rugby tournaments beyond 2015 - when a broadcast deal between the three member unions expires. But Piet Heymans, the CEO of SARPA, warned that any split could be detrimental to the game. "The players view Super Rugby and the Tri-Nations as the best rugby competitions in the world and also the toughest to participate in," he said in a statement. "The players are concerned that emotions are driving the current differences within SANZAR. Should the SANZAR partnership be dissolved it could have serious implications, not just for South African rugby but world rugby as a whole." The professional players are currently being paid by the proceeds of the SANZAR broadcasting agreement and this is the lifeline of South African rugby and should not unnecessarily be put at risk as it could affect hundreds of professional players in South Africa, New Zealand and Australia should this partnership be dissolved." The divisions emerged after several conflicts of ideas in recent months, the most notable being SARU's gripes about referees in the away games of the Tri Nations where northern hemisphere officials took charge. Other problems that have arisen include the charge of misconduct against coach Peter de Villiers, disciplinary hearings that went against South African players and a letter from SANZAR regarding SARU president Oregan Hoskins' "declaration of war" comments over the De Villiers charge. Heymans urged officials from all three sides to come to an amicable solution. "During the renewal of the SANZAR broadcast deal various alternatives were investigated and the reality is that there are not viable options that can provide the players and the public with exciting world-class rugby. "SARPA believes that the current strained relationship within SANZAR should be addressed in a constructive manner and that ways and means should be investigated and implemented to try and resolve the differences within SANZAR in a professional manner. "These differences should not lead to the dissolving of the SANZAR partnership. Like any other partnership differences will arise, but it is important how they are addressed and dealt with." He also urged SANZAR to put the interest of players at the forefront of any decision-making. "The players have a vested interest in SANZAR and the administration of professional rugby," he added. "It may well be in the interest of SANZAR that the players are more directly involved in the administration of SANZAR, especially when important decisions and differences are made and discussed."